The Vinery Hair Salon: Street Chic for the Clubstar Team! The Vinery Senior Stylist Gemma Noon found herself collaborating with award winning stylist Kai Wan for the latest British Hairdressing Fellowship Clubstar Team collection in London this season. The photoshoot with Kai Wan led with the brief of Street Glamour “Capturing the essence of chic but edgy street style” with each individual team member developing and creating their own interpretation to fit. 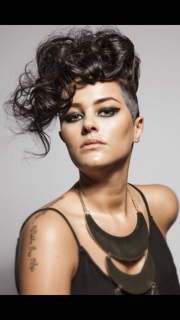 Gemma carefully chose her model based on her unique look and established undercut which had already been worked on in-salon.